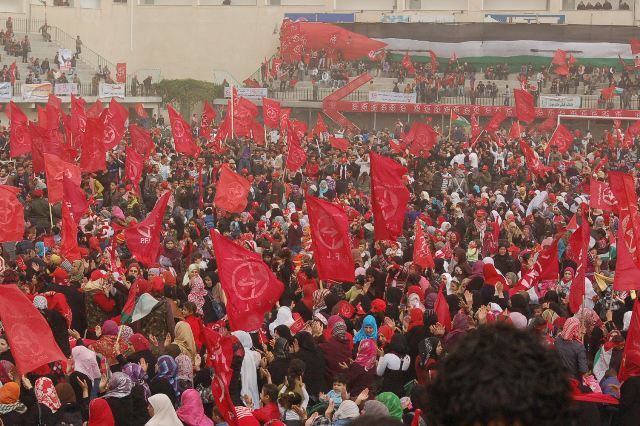 Comrade Jamil Majdalawi, member of the Political Bureau of the PFLP, delivered the main speech of the rally, emphasizing the need for Palestinian national unity to confront the occupier and build the resistance in the face of all repression. He emphasized that the Palestinian people have the right to all forms of resistance, including armed, popular and economic resistance, and that resistance is the only solution to the occupation. He denounced the accumulation of wealth, power and influence at the expense of the struggle of the Palestinian people, saying that it benefits the enemy only. He called upon Hamas and Fatah to move toward reconciliation and prioritize the national struggle of the Palestinian people. He denounced the path of “negotiations” and “peace talks” flowing from the Oslo accords and said that the masses of the Palestinian people must lead a collective reevaluation in order to learn the lessons of this period to continue the march of the Palestinian revolutionary struggle. He emphasized that for the PLO to fulfill its role as an umbrella uniting the people, it must be democratic and embrace all of the parts of the Palestinian national movement in a pluralistic manner, based on democratic elections and proportional representation. Comrade Majdalawi paid tribute to the Front’s leadership and history, calling for the freedom of General Secretary Comrade Ahmad Sa’adat in the jails of the occupier, and the freedom of his comrades and all Palestinian prisoners, and saluting the legacy of past General Secretaries Abu Ali Mustafa and George Habash. He noted the strength and importance of the involvment of young people and women in all activities and at all levels of the Front and the Palestinian movement. Comrade Musab al-Bashir, a freed former prisoner, spoke about the struggle of prisoners, calling on all forces to prioritize the case of Palestinian prisoners, and pointing to the prisoners’ movement as an example of ending the internal division. He discussed the ongoing crimes and abuses being committed against prisoners in the Zionist jails, and emphasized the commitment of the Front on the 43rd anniversary to its imprisoned comrades and all of the imprisoned sons and daughters of the Palestinian people. The festival included artistic performances, speeches and poetry and concluded with a new song performed by the Palestinian artist Ahmed Assaf entitled “The Backbone of the Front”. “The Workers Party of New Zealand would like to send revolutionary greetings to the Popular Front for the Liberation of Palestine (PFLP) on the 43rd anniversary of the founding of the front. On this occasion we would like to acknowledge the leadership provided by the PFLP to the national movement, and their unwavering struggle for a free democratic secular socialist Palestine. We remember and recognise the leadership provided by George Habash and Abu Ali Mustafa, and continue to call for the release of the current General Secretary Ahmad Sa’adat, who was recently condemned to further isolation by a Zionist military court. 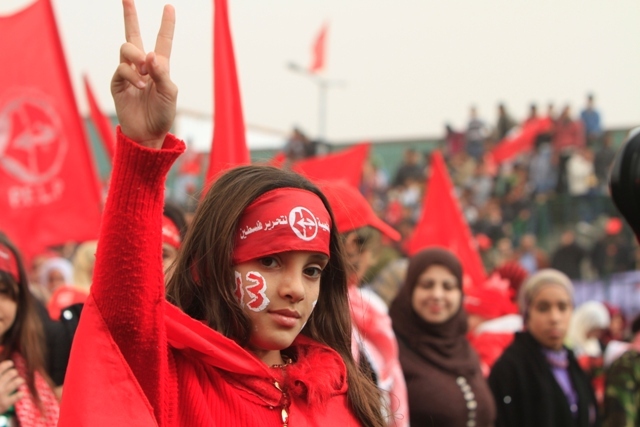 We beleive it is more important than ever to challenge ‘Terrorism’ laws that condemn National Liberation Movements such as the PFLP as terrorists. Terrorist Legislation can only be seen as a part of a system that is used to maintain the imperialist powers spheres of influence in the third world, including Palestine. And the truth is that many of the Liberation Movements condemned as terrorists represent a direct threat to western control of third world resources, economies and politics and thus the maintenance of capitalism worldwide.